In Silico Drug Discovery and Design: Theory, Methods, Challenges, and Applications provides a comprehensive, unified, and in-depth overview of the current methodological strategies in computer-aided drug discovery and design. Its main aims are to introduce the theoretical framework and algorithms, discuss the range of validity, strengths and limitations of each methodology, and present applications to real world problems in the drug discovery arena. Special emphasis has been given to the emerging and most pressing methodological challenges in in silico drug discovery and design. The book assumes a basic knowledge of physical principles and molecular modeling. Particular attention has been paid to outline the underlying physico-chemical foundation of the methods described, thus providing the necessary background to avoid a "black-box" approach. In each self-contained chapter, this is presented together with the latest developments and applications, and the challenges that lie ahead. Assembling a unique team of experts to weigh in on the most important issues influencing modern computational drug discovery and design, this book constitutes both a desktop reference to academic and industrial researchers in the field, and a textbook for students in the area of molecular modeling and drug discovery. 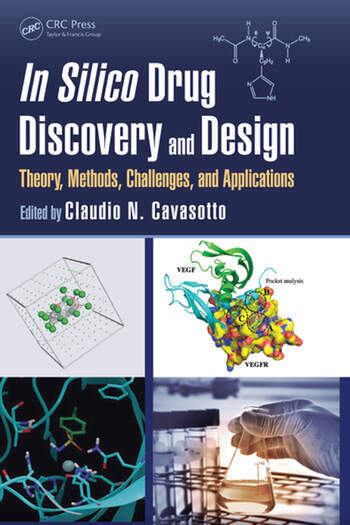 In Silico Drug Discovery and Design: Theory, Methods, Challenges, and Applications describes the theoretical framework, methods, practical applications and case examples relevant to computer-aided drug lead discovery and design. This text will surely aid in understanding the underlying physical foundation of computational tools and their range of application, thus facilitating the interpretation of simulation results. Meagan C. Small and Alexander D. MacKerell, Jr.
Claudio N. Cavasotto earned his MSc and PhD in physics from the University of Buenos Aires. He conducted his postdoctoral training at The Scripps Research Institute after which in 2002 he moved to MolSoft LLC, La Jolla, California, as senior research scientist, where he remained until 2007. He then became assistant and associate professor at the School of Biomedical Informatics at the University of Texas Health Science Center at Houston. In 2012 he moved to the Biomedicine Research Institute of Buenos Aires-Partner Institute of the Max Planck Society, where he is head of Computational Chemistry and Drug Design. His research interests are primarily biomolecular simulation, computer-aided drug discovery and cheminformatics. His group develops and applies computational methods to study molecular interactions in biological systems, and to design molecules which modulate targets of pharmaceutical relevance. "... an ambitious book which delivers a great deal of material in one volume. ... a useful addition to the small number of accessible and authoritative books on the subject." "… With this book the lids on the algorithm black boxes are lifted and all within the field can clearly see their inner workings. … This book also has the capacity to enthusiastically galvanize those at the cutting-edge of algorithm development. The Thorny problems remaining are illuminated and attacked with vigor, such as how target flexibility and solvation at molecular interfaces can be more accurately modeled and how this may ultimately feed into a better determination of BINDING free energies and the calculation of accurate kinetic parameters." "… a solid, current, well-written and well-organized set of reviews of important topics in in silico drug discovery. It should be useful for readers, ranging from students to senior scientists, who are looking for accessible overviews of this material."